The University of Reading's stunning Whiteknights campus has once again been judged as one of the best green spaces in the country, with the award of the prestigious Green Flag. The Award, which has been given to Whiteknights for the fifth consecutive year, is a sign to visitors that the campus is well-maintained and well-managed, with excellent facilities. Professor Robert Van de Noort, Pro-Vice-Chancellor for Academic Planning and Resource, said: "We are delighted to have gained a Green Flag Award for the fifth year running. Our attractive grounds continue to be a factor which differentiates Reading from our competitors. 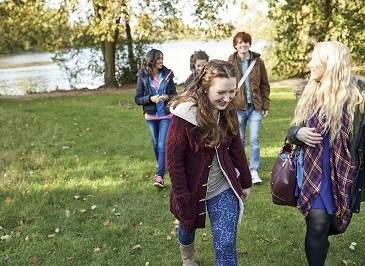 Recent student satisfaction surveys have highlighted the fact that the ‘attractive campus environment' is a key factor in undergraduates choosing to study at Reading. "Whiteknights is also an important resource and green space for the local community. I thank the University Grounds staff for all their hard work, as well as the efforts of many volunteers who help in the Harris Garden or lead guided walks for visitors to campus each week." The Award also recognises the University's environmental and sustainability initiatives - green waste re-cycling and composting, energy conservation and carbon reduction targets, bio-diversity initiatives such as woodland management and car-sharing and green travel schemes. A ceremony to hoist the Green Flag over the Whiteknights campus will take place in the next few weeks. Come and visit our award-winning campus at our next Open Day.